On the day after St. Patrick’s Day in 1985, Jim Koch got a phone call. It was his mother’s cousin, whom Koch considered an uncle and who was an investor in Koch’s new Boston Beer Co.
“So what did you do today?” asked the uncle, a partner at Goldman Sachs in New York. Koch, speaking from Boston, replied that he had begun the search for a computer. To keep track of things such as payables and sales. The conversation floored Koch. Why was he looking for a computer? He didn’t even have an office for the new brewing company, one of a handful in the United States then making small amounts of beer from traditional ingredients. When they weren’t working out of their respective Boston-area homes, Koch and co-founder Rhonda Kallman over the last year or so were snatching spare time during their day jobs at the Boston Consulting Group, one of the world’s largest management consultancies, to nudge Boston Beer forward. They had investors. They had a business plan. They had five batches of a flagship beer called Samuel Adams Boston Lager aging in tanks at the Pittsburgh Brewing Co. But they had no accounts. It was time to sell or sink. 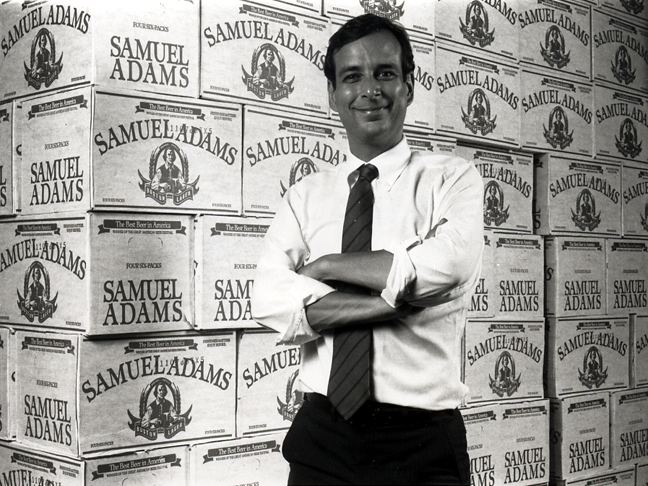 Jim Koch with the first cases of Samuel Adams Boston Lager in 1985. Photo courtesy The Boston Beer Co. The story of Koch’s—and Boston Beer’s—first sale has been told often. He walked into a random restaurant during a break in his day in downtown Boston, pitched himself and his product as quickly as possible to an employee who didn’t understand English and then pitched it all over again to the employee’s manager. What’s less well-known, and more remarkable, is how Koch even came to make that sale, and thus to start growing Boston Beer into one of the biggest breweries in the U.S. and one of the most influential stylewise in the world. More than 10 years before that first deal, Koch had been in the masochistic dual law-MBA program at Harvard. Sales were barely referenced in his business classes. They were just sort of something that happened when the marketing team at a company got done targeting a product. At worst, fellow MBAs saw salesmanship as a career Plan B, a grubby thing a businessman would only undertake if all other avenues closed to him. That wouldn’t do, of course, if Boston Beer was going to be successful. Koch had to overcome his aversion to sales, and he did. 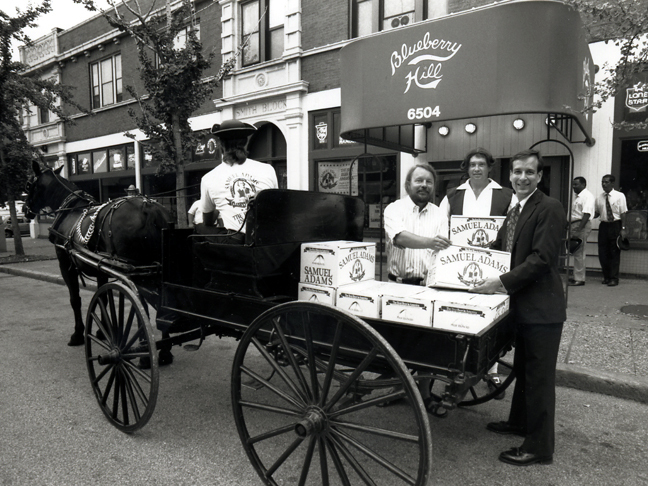 Jim Koch (far right) selling the first cases of Samuel Adams Boston Lager in 1985. Photo courtesy The Boston Beer Co. The rest, as they say, is history. Koch’s Boston Beer is ubiquitous coast-to-coast now, and you’ll see it overseas, also. Koch is pretty ubiquitous, too, having grown during the 30 years since that avuncular phone call into what once seemed, for him, that unlikeliest of things: a great beer salesman.